The Pilkington’s MirroView is a reflective mirror surface with a clear substrate, allowing a screen to be viewed without any loss to the functions of the mirror – This allows you to see your reflection while simultaneously watching television or checking your emails. The screen can also then be hidden so that only the mirror remains, all at the touch of a button. The MirroView is compatible with all touch screen technologies, making them the perfect solution for smart mirrors. The Pilkington MirroView comes with a Pyrolytic Coating, which is highly durable and long lasting (giving the product a virtually limitless service life). Available in 2 different thicknesses: 3.2mm and 6mm. The Mirroview 50/50 offers all the benefits previously mentioned, however it is only available in 6mm thickness currently. Both Mirroview and Mirroview 50/50 can conceal one or multiple different screens, offering an endless possibility of bespoke design opportunities for your home or commercial property. If you’re looking for a stylish, smooth mirror with a neutral reflective tone and underlying display, the Mirroview could be perfect for you! Next Gen Glazing work with both domestic and commercial clients throughout Barnsley, providing design advice and a complete installation service (includes the supply of required products). 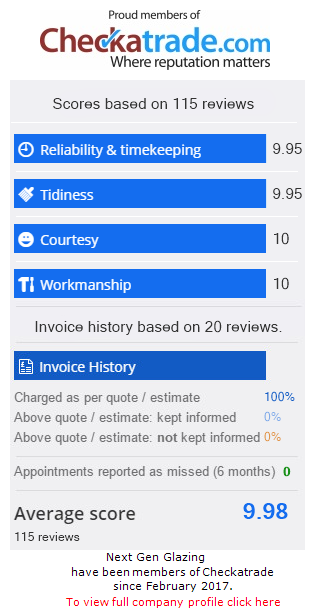 Our expert team have over 30 years of experience with glass installations and have maintained an exceptional feedback record over on our Checkatrade page – Rest assured that you’re in safe hands with Next Gen Glazing! If you’re interested in installing Pilkington Mirroview Glass, get in contact with us today to discuss your options or receive a free no obligation quote. You can call us on 01226 741480 or simply fill out the enquiry form located on the right and we will get back to you as soon as possible.